Sir Geoffrey Esmonde was one of the 30 Anglo-Norman knights who landed at Bannow Bay, with Robert FitzStephen, in 1169. His descendants from Lincolnshire in England, settled in the Baronies of Forth and Bargy in County Wexford, building castles at Rathlannon and Johnstown; and establishing a seat at Huntington Castle in Clonegal. After the Cromwellian conquest of Ireland in 1653, a John Esmond of Rathlannon, who had stayed loyal to the king, and four dependents, were listed for deportation. 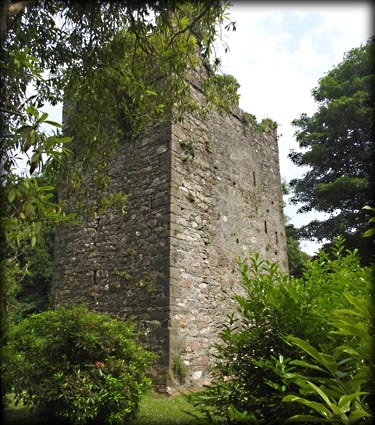 Rathlannon castle is a, possibly 15th century, rectangular tower house. The walls bear scars from the many alterations the have taken place over the centuries, but surprisingly the quoins are in excellent condition. The surviving corbel stones of a machicolation, jut out from the north east wall, above the pointed doorway. At some stage the interior was completely re-modeled in brick. There is no access to the overgrown interior at present. Situated: On the grounds of Johnstown Castle Estate. See below. Discovery Map 77: T 0186 1659. Last visit June 2017. 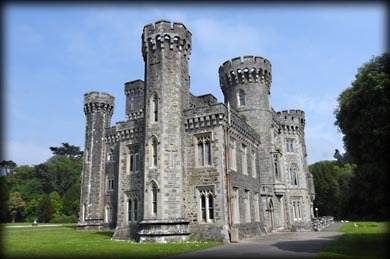 Rathlannon Castle is situated on the grounds of Johnstown Castle Estate. It is also home to the Irish Agricultural Museum. 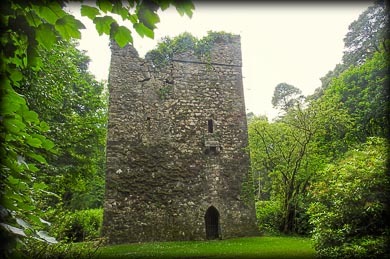 The 16th century tower house that stood at Johnstown was removed in 1945. The present castle is a mid 19th century Gothic Revival structure, with later additions/alterations. The castle and grounds were donated to the state by descendents of the Grogan family who held the estate from 1692 until the mid 1940s. There is a small fee to enter the grounds of the estate during the summer months. Situated: From Wexford Town head south on the R730. After 1 kilometre turn right for Murntown. Go straight through the roundabout after Rathaspeck Manor. The entrance to the Johnstown Estate is on your left about 700 metres after the roundabout. Discovery Map 77: T 0196 1685. Last visit June 2017.